NATL is a wonderful place to learn about Florida's ecosystems. Please feel free to enjoy the area while considering these guidelines. NATL is a great place to introduce children to the wonders of outdoor Florida. For ideas to engage children see our Family Fun and K-12 Education page. • NATL is a great place for wildlife watching. For an inventory of NATL’s biodiversity check out the biota pages. • Areas open to the public include the SEEP (Stormwater Ecological Enhancement Project), upland pine, old-field, and hammock areas. 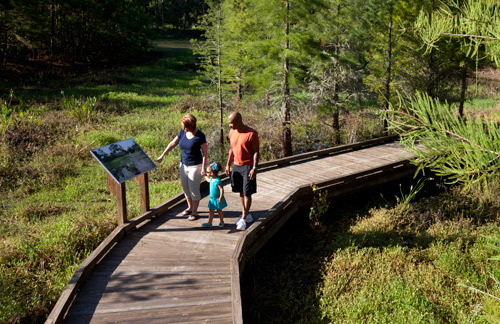 Signs and kiosks along trails allow visitors to tour at their own pace. For more information see the ecosystems and nature trails pages. • Visitors are welcome to bring dogs as long as long as policies are observed. • Picnic tables in the Natural Area Park make NATL a relaxing get away for lunch. • The part of NATL-west that lies south of Division Trail and all of NATL-east are designated for academic use only. The public is excluded, but students, faculty, and classes have free access for academic purposes. The reason access is restricted in these areas is to make them more suitable for student research projects that require equipment and markers to remain undisturbed. • Stay tuned for citizen scientist projects taking place at NATL!